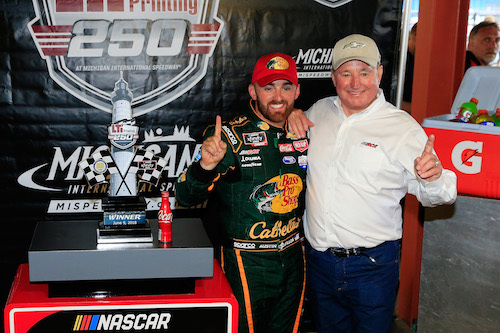 Richard Childress Racing snapped a 55-race NASCAR Xfinity Series winless streak with a one-two finish by winner Austin Dillon and runner-up Daniel Hemric on Saturday in the LTi Printing 250 at Michigan International Speedway. Rain interfered with the on-track schedule at MIS throughout the day on Saturday, especially when it came to the Xfinity Series, forcing the cancellation of qualifying, delaying the start of the race by three hours and abbreviating the race from a 125-lap scheduled distance to 91 laps. Dillon was counting on that rain when he stayed out during a rash of late-race cautions, hoping rain would force NASCAR’s hand into calling the race early, before he ran out of fuel. The call paid off when Dillon was close to running out of fuel. Xfinity Series points leader Elliott Sadler made a similar decision after winning the second of two 30-lap stages. He was running third when the yellow flag waved on lap 56 and opted to stay out, inheriting a lead the he maintained for one green-flag lap that remained in the stage. Then, despite staying out during the lap-56 yellow, he stayed out again during the next caution at stage-end. Sadler, though, was taken out of contention, courtesy of an incident that also involved Alex Bowman and Austin Cindric on lap 73. Sadler was able to continue, but he had to make an unscheduled pit stop for a cut tire a few laps later. As a result, he wound up with a 30th-place finish, his first finish of the year outside the top-10. Kyle Busch was the winner of the first stage after starting on the pole and leading 28 of the first 30 laps. He led a total of 29 of the 91 laps completed and finished sixth. Other top-10 finishers included Cole Custer in third, Ryan Reed fourth and Paul Menard in fifth. Finsihing seventh through 10th were Tyler Reddick, Kevin Harvick, Justin Allgaier and Ryan Truex. Saturday’s race was the second-consecutive for the Xfinity Series featuring the aerodynamic package debuted by the series in last year’s race at Indianapolis Motor Speedway, including restrictor plates, aero ducts and taller spoilers.